The UDC Counseling and Wellness Center is available to promote psychological wellbeing that helps students reach their academic, personal, and relational goals. We work to help you address any issue that may be interfering with your wellbeing or success. Services are provided by trained professionals and are fully confidential. To become a student mental health center that is recognized for its commitment to professional excellence, invaluable outreach, and accessible programs and services that meet the unique needs of the UDC community. We believe that every student has basic and unique needs which must be fulfilled in order to function successfully in a learning environment. The UDC Counseling and Student Development Center is committed to promoting psychological wellbeing that ultimately helps students reach their academic, personal, and relational goals. Our counseling services and programs emphasize self-awareness, relational fulfillment, self-care, and personal growth. By providing students with accessible mental health services and educating the university community regarding psychological wellbeing we aim to foster a healthy learning environment. Call or walk-in to schedule an initial confidential consultation today! The screenings are quick and anonymous. Once you click on the link below you will have the option to take one or more of several screenings (depression, eating disorders, anxiety, alcohol problems, etc.). Just read through the descriptions and take as many as you need or want. The screening tools are not diagnostic instruments. If you are concerned about your own problems or the problems of another person please contact the Counseling and Wellness Center at 202.274.6000. 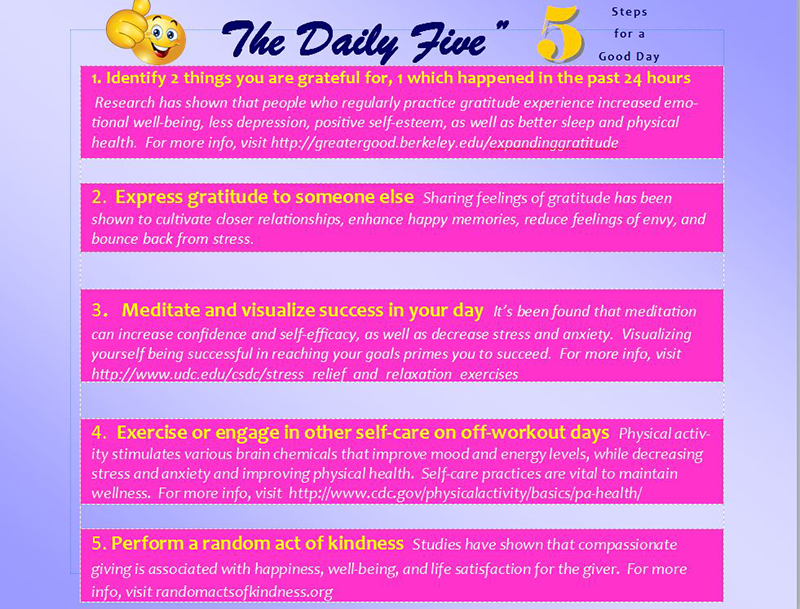 Five Steps for a good day!